Over the years we have designed and made a lot of different styles , sizes and kinds of medicine bags / amulet bags for our customers. Each individual has a purpose and reason why they need a special bag in their life. Some are for a special stone, crystal or medicines ( like sage, cedar , tobacco or whatever is their favorite). They can be used to keep a special piece of jewelry in while traveling. There are so many ways to use them. The reason to say “special medicine bags ” is because they are special , just for you or can be given as a gift and cherished forever. I do many beaded medicine bags. Some with totems of a special kind like wolf paw totems, bear claw totems , turtle totems or sometimes just a nice colorful chevron. Whatever speaks to your heart. This week I worked on a sweet small white buckskin medicine bag that has a lot of glass crow beads and tin cones on it. I liked it so much I made another one and added it to our shop . It dances and sings. Why? Because of the long fringes with the beads and cones. They jingle a nice song! This kind of special medicine bag can be worn around the neck or it could be used for home decoration. It would be a special keepsake gift for a special friend. Fringed white medicine bag with glass beads and cones. This is a small neck bag with beaded chevrons. A very simple and beautiful small leather pouch. To see more of our small pouches come by our online stores and check out what we have. If you need something special made up just let us know we do special custom orders. We have created many things this week. One of my favorites is the brown medicine bag with the beaded sunflower, double cut fringe off the bottom of the bag and a 36 inch neck strap. What is a medicine bag? That is something I used to be asked when I did art shows. We have sold these bags to many people from all over the world. They would tell us I need this for my favorite stone, crystal, carved fetish, to keep my wedding rings in while traveling or even the tooth fairy. Yes , the tooth fairy. I thought what a cute idea. Making losing a tooth an even more special event. I have used mine to keep a special feather, rock , medicine like sage, cedar or whatever in. It all depends on what your needs are. You can make a special prayer and wear it or carry it with you reminding you of what your intent is. So medicine bags or amulet bags are totally multi purpose. John and I have a lot of different sizes and kinds of medicine bags. Some are beaded some are plain, we make custom ones to fit the needs of our customer friends. Sometimes we put a turtle, bear claw or wolf totem on. I also do four direction beadwork with your colors where you like them. Recently we found some carved antler tips from a friends store Ted Parker from Antler and Ivory and I made this small medicine bag. Come by and see us on Etsy . You will find a wide assortment of leather handbags, beaded leather bags, medicine bags, pipe and flute bags and much more. It’s getting close to time to be thinking about the Holiday season. Not that any of us need an excuse to buy beautiful handmade items. Today lets talk about the smaller items that can be a gift for a small child to an adult. 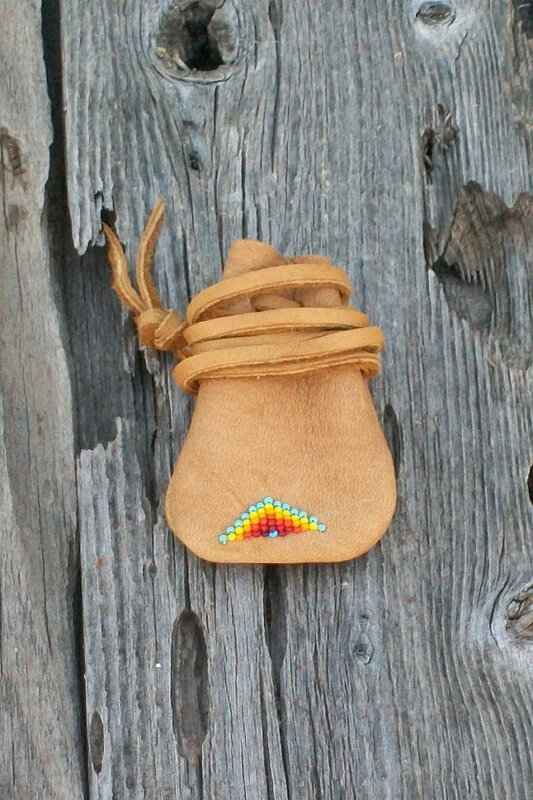 Like this beaded leather pouch that is a double drawstring pouch with earthy colors and measures 5 inches tall x 4 inches wide. Small bags and pouches can be used in a variety of different ways. They can hold your special stone or crystal, be worn around your neck as a necklace bag or whatever your needs may be. 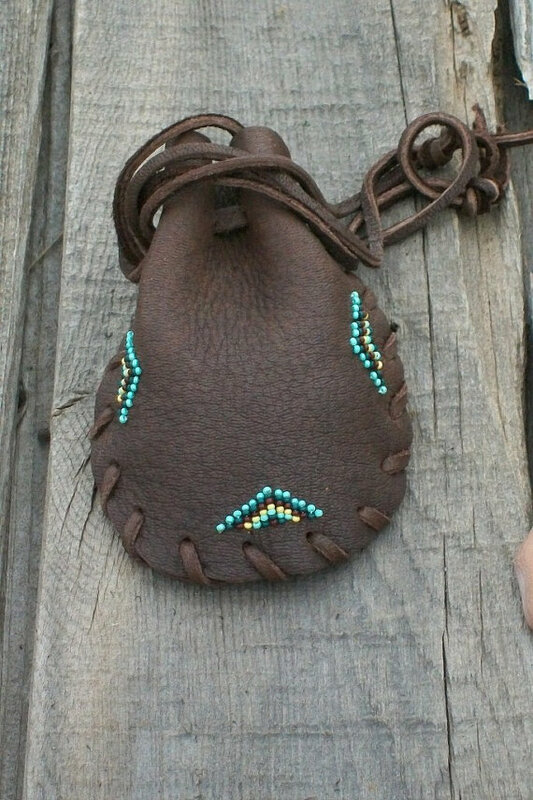 In our shop we off a wide variety of different sizes and styles of leather pouches in different colors of leather and beadwork. We have dragonfly bags, turtles bags , bags with fringe and plain leather pouches. This small pouch measures approximately 3 inches tall x 2 inches wide and has a splash of bead work on the bottom. It is made in saddle tan elkskin leather. This is just two of the small pouches we offer in our Etsy shop to see more go here.